The Society of Saint Pius X has an article on their site, where they are asking for help in sponsoring pilgrims for a trip Europe and the Holy Land. The young pilgrims will be going to Jerusalem, Bethlehem, Rome, Turin, Lourdes, Chartres, La Salette, Santiago de Compostela, and Fatima (perhaps more places – I copied this list from the article). I have also received a letter with the same appeal. It is good that, as Catholics, we have so many worthy causes that we can support – funding chapels, schools, food kitchens, sponsoring pilgrimages, and more. This looks like a very worthy effort to contribute our funds to. 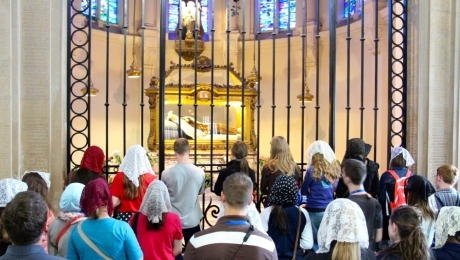 By participating vicariously in this pilgrimage, you will help our youth execute a public act of faith and form in themselves a true Christian spirit according to the perennial practices of Catholic Tradition. Our youth pilgrimage is not a joy ride to Europe where the schedule is slow-paced and the youth enjoy the luxury of first-class hotels. Rather it is a pilgrimage of prayer, reflection and sacrifice. The days can quite often be exhausting and the whole trip concludes with a grueling 65-mile march from Chartres to Paris. Still, the aches and pains are no match for the reward that is experienced by the pilgrims upon reaching their goal. This pilgrimage is “a little glimmer of the happiness promised to those who make it to heaven” as one young woman described her experience to me. It sounds like something I would like. One of these days I would love to make the same march from Chartres to Paris. This entry was posted in Catholic, SSPX. Bookmark the permalink.